Poor little bun. At least you had the compassion to take him in and euthanize him. And I totally agree. I hate people. That is SO sad and makes me FURIOUS. Whoever did that should have to shovel bun poop for the rest of his/her life! 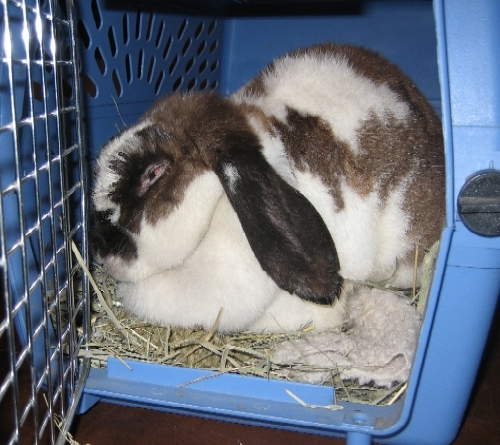 I am a rabbit Rescuer in Los Angeles – THANK YOU for writing about this all too common occurrence. Is there really any excuse for treating any animal like this? I understand why it was brought to you – but MY WISH is that people would realize that what these animals need is proper care and housing in the first place. So often I have looked into the eyes of the person on my doorstep holding the horribly neglected and abused rabbit and KNOWN that they did not ¨Just Find it¨ It takes weeks of neglect to make an animal that sick. If this poor bunny has a legacy – let it be to teach responsibility and compassion. Rescuers are not the only folks capable of doing the right thing. Everyone CAN. Everyone SHOULD. Many more WOULD if it was a dog, cat or child. But many would still turn a blind eye. We can do better. nuff said.